For those of you who have been tolerating my stories of the engagement, showers, and plans, I thought I'd share some stories from the weekend. It was wonderful, and everything that you would hope a big country wedding would be. As tired as we are all were, I know most of us didn't want it to end, because you just can't beat all of that time together with family and your closest friends. I loved it all. So here are several funny/interesting/memorable moments from the nuptials of Mr. and Mrs. Zimmerman. 1. 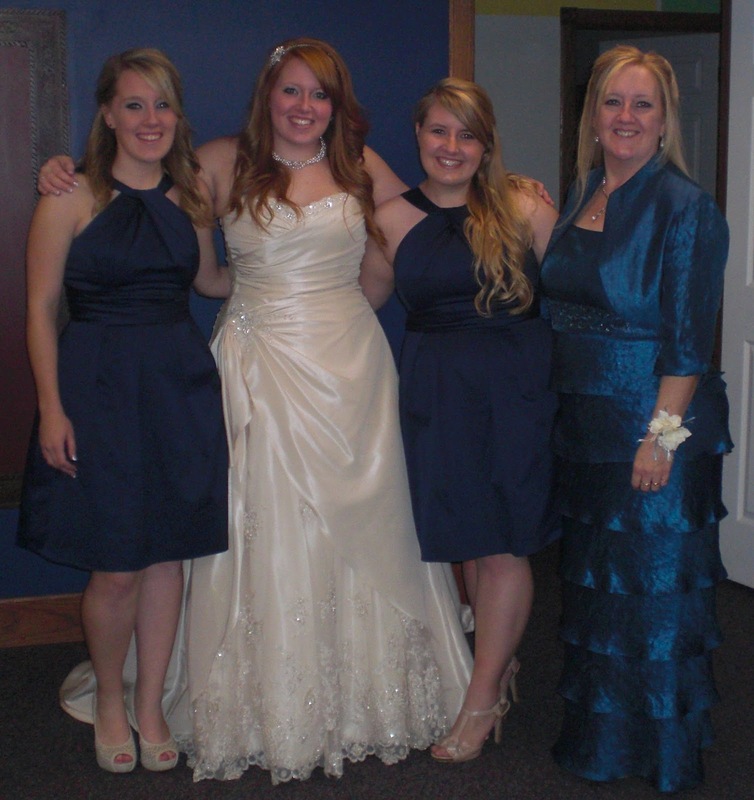 My sisters and mom are beautiful, inside and out. Check out the picture for proof. 2. Steph was the easiest and calmest bride I have ever seen. The thing she said most frequently all day? "Whatever you want." On her wedding day. The photographers were friends from our early college days (check out their business here, and see a few of the shots of the day here). Mary the photographer said, "I love Steph. I mean, I loved her before, but seriously, she is the easiest bride ever. I love her." 3. Steph and Steve have phenomenal guy friends. It was a busy day, but as we ran around, it was nice to be around such gentlemen. Opening doors, giving us their coats, dancing partners, carrying things all of the time...it was nice to be taken care of. 4. If you were to ever have a medical emergency, I would hope it would happen around the new Mr. and Mrs. Zimmerman and their friends. The make the story brief, my aunt started having chest pains at the reception. Emily and I happened to have just snuck out to another part of the building to have a quick chat about our toast when my aunt and her two daughters came in, and my aunt was not in good shape. Fast forward a minute, and we had a very sick lady, an ambulance on the way, and me running down the hall and then walking sedately across the dance floor to the head table. (Think the missing FOB scene in the Wedding Planner) My new brother-in-law is a volunteer firefighter and EMT, and there were many many medical professionals/first responders in attendance. To Steven, I said, "Everything is ok, but tell me who is an EMT who is not in the wedding party." He immediately jumped up, and I said, "Not you. Tell me who else." He got up to get a friend who was sitting in the balcony who has lots of years of experience. Fast forward a few more minutes, and despite me trying to keep the wedding party in the reception (because not even the parents knew what was going on yet), the groom was on the floor in front of my aunt with his EMT bag from his truck, another groomsman was taking her vitals, and a bridesmaid was talking to her and trying to keep her conscious. The bride was hugging my crying cousin, and the best man and I were outside flagging down an ambulance. Fortunately, the DJ just kept people going by starting the slideshow, playing some tunes, etc. No one even knew what was happening until we had to have the DJ announce the situation because we could hear sirens. The ambulance crew loaded her up, and (after blowing a tire) took her to the closest hospital. Even more fortunately, she returned a couple of hours later with the rest of the family after being released by the doctors there. I am so glad that she is ok, and even more glad that we had so many people to help in such a scary situation. And it made me admire and love Steven and Steph even more, as I watched them be the first ones to react and help even at their own wedding. 5. Speaking of ambulances, I fell down the stairs at the church about 15 minutes before the ceremony. I tried to hold in my scream so that no one would hear and come running, but didn't quite succeed. 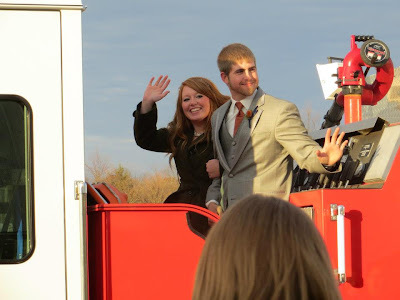 I remember immediately thinking that I would rather die than draw attention to myself by getting hurt at their wedding. Fortunately, I just had several new bruises and some gorgeous rug burns, which looked lovely on my dayglow white legs in my knee length dress. However, no one was looking at me because Stephanie was so beautiful. I am so grateful that I fell down the stairs then, not during the ceremony, or during the entrance at the reception. I am also grateful that I did not break my ankle, neck, or shoe. Especially the shoe. I really liked my shoes. 6. There were a few little flubs that happened throughout the day, as is to be expected. I don't think hardly any of them were noticeable, but one of them was really annoying to me. 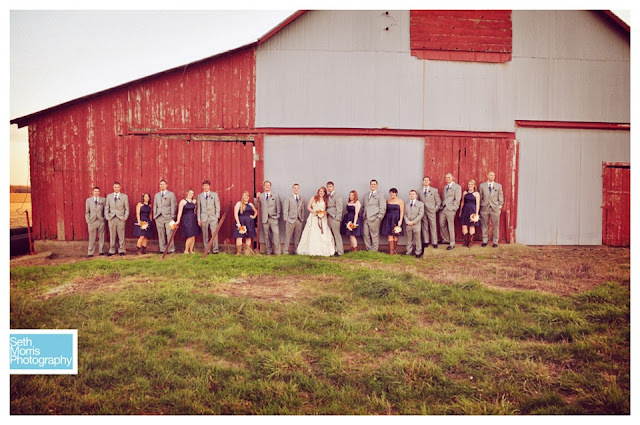 The bridal party had a really long entrance, because the guests were seated on two levels. We walked in through the balcony and then down a huge flight of stairs. The DJ (who was great overall) announced us really slow, and he played this terrible jazz elevator muzak, which seemed to make us walk even slower. Blek. However, it was a fun contrast to the sirens and fireman call he played as Steph and Steve were introduced, Steven in his fire helmet and the wedding party dancing to Party Rock Anthem. It is all about them, anyways. 8. Emily and I did our toast together, and it was improvised kind of at the last minute (our prep was interrupted by #4). It included a purple plastic knife as a prop, jump ropes, the Oregon Trail, and a reenactment of the Exodus. I guess you just had to be there. 9. As the MOH, I tried to make like a boy scout and be overprepared and packed a ton of stuff that we might need. Surprisingly, we used a lot more than I thought. Here are a few of the things borrowed from me by other people- needle and thread, chapstick, lipstick, deodorant, disposable toothbrushes, medical tape, hair pins, writing pens, sharpies, paper, lint rollers, mascara, bandaids, first aid cream, curling irons, hairspray, copies of the schedule, qtips, nail polish, and cotton balls...just in case you needed to pack an emergency wedding kit sometime soon. :) Thank you so much for the great post Katie! I am so glad to hear the day went so well, mainly in part to the amazing group of people present. Love it all!